Don't leave me, Nina Simone! Eunice Kathleen Waymon was born on February 21, 1933 in Tryon, North Carolina, USA., the sixth of eight children, four boys and four girls. By the age of four, she had revealed a prodigious musical talent playing the piano and singing in the local church with her sisters in their mother's choir. At the age of six, in 1939, a benefactor paid for her first piano lessons. Eunice made so much progress that in 1943, when she was 10, she gave her first piano recital at the town library. There she not only experienced her first applause, but also had her first encounter with racism: during the recital her parents were removed from the first row to accommodate some whites. This episode was a traumatic experience for her and may be the origin of her commitment to the fight for freedom and civil rights. With the financial help of some local supporters, Eunice left North Carolina in 1950 to continue her musical education at the Juilliard School of Music in New York, the same school that Miles Davis attended. After New York her family moved to Philadelphia. She tested for a scholarship at the prestigious Curtis Institute in Philadelphia but was rejected, ostensibly for musical reasons, but probably for her color. Feeling discouraged, in order to support herself and pay for further lessons she became an accompanist for a singing teacher. Later, in 1954, she took a job as a singer-pianist in the Midtown Bar and Grill in Atlantic City, adopting the stage name of Nina Simone. Nina (niña means "girl" in Spanish) from a pet name that a boyfriend gave her, and Simone (from the French actress Simone Signoret) for its dignified sound. It was at Midtown Bar, where Nina Simone sang, played and improvised, that her career took off. Subsequently she played in several Philadelphia clubs. Recognized as a talented pianist, she was given a recording session with Bethlehem Records in 1957; in this session she records 14 tracks. Simone's first album Jazz as played in an Exclusive Side Street Club (11 tracks), published in 1958 and by then also know as Little Girl Blue, was a great success, first in Philadelphia and New York and then in the whole US. The single released from that recording (featuring "I Loves You Porgy" and "He Needs Me") became a national rhythm & blues (placing 13th) hit in the summer of 1959, selling over a million copies. Thanks to the success of her first recordings, in 1959 Simone signed with Colpix (Columbia Pictures Records) a collaboration that lasted until 1964. Nina recorded 10 albums while signed to Colpix: six studio and four "live" albums. She recorded some songs of Columbia film soundtracks (including "Wild Is The Wind", "Sayonara", "Samson and Delilah") as well as a new version of the Bethlehem hit "I Loves You Porgy". In 1961 she recorded the traditional song "The House of the Rising Sun". The same song was recorded by Bob Dylan in his debut album, issued in March 1962 and subsequently by the Animals in 1963. In the summer of 1964, "The House of the Rising Sun" by the Animals was at the top of the American and English charts, on the eve of the band's US tour (part of the "British invasion"). In 1961 Nina marries Andy Stroud, a New York detective and in 1962 their daughter Lisa Celeste Stroud is born. In 1964, Nina Simone began her association with Philips, a Mercury subsidiary. This collaboration lasted for three years during which Nina recorded seven albums. One of the first songs recorded during the Philips period is "Don't Let Me Be Misunderstood", from then associated with her name. The song was covered by the Animals in 1965, the same year Nina published "I Put a Spell on You", a 1956's song by Screamin' Jay Hawkins. During her association with Philips, Nina led the way to the protest and wrote "Mississippi Goddam! ", written after the murders of Medgar Evers in Mississippi (June 1963) and four black schoolchildren in Alabama (September 1963). In 1966 Nina switched to RCA (where she was to stay until 1974: to date her last long-term affiliation with an American label), a deal negotiated by her husband who acted as her manager and to whom some compositions are credited. From the summer of 1968 through the end of 1969, "all of her recordings were produced by her husband-manager, although we can assume that it was really Nina who was making the final selections of repertoire and essentially masterminding the sessions" according to David Nathan. While at RCA Nina recorded nine albums and some of her most popular songs. Her version of "Ain't Got No/I Got Life", a medley from the 60s musical Hair, was number 2 in UK and her soul version of "To Love Somebody" by the Bee Gees got into the Spring of 1969 Top 10 British chart. "To Be Young, Gifted And Black", inspired by a play of the same name by Lorraine Hansberry, a friend of Nina, was recorded by Aretha Franklin in 1972. Embittered by racism, Nina renounced her homeland in 1969 and became a wanderer, roaming the world. She lived in Liberia, in Barbados, Switzerland, France, Trinidad, the Netherlands, Belgium and UK at various times. In 1970 she and Stroud split up, and Nina attempted to manage herself and work with her brother Sam Waymon. In 1974 she left RCA. In 1978 Nina was arrested, and soon released, for withholding taxes in 1971-73 in protest at her government's undeclared war in Vietnam. In 1987 her previously-mentioned European success with "My Baby Just Cares For Me" brought Nina back into the public eye: her music was featured in 1992 movie 'Point Of No Return', with the lead character using Nina as inspiration. That same year she recorded 'Let It Be Me' at The Vine Street Bar & Grill in Hollywood for Verve Records. She moved to the southern French town of Bouc-Bel- Air near Aix-en-Provence in 1993. A protest singer; a jazz singer; a pianist; an arranger and a composer, Nina Simone is a great artist who defies easy classification. She is all of these: a jazz-rock-pop-folk-black musician. In fact, we can find her biography in jazz, rock, pop, black and soul literature. Her style and her hits provided many singers and groups with material for hits of their own. No less than five songs from her repertoire were used in the 1993 motion picture sound track of "Point Of No Return" (also called "The Assassin, code name: Nina"). Many other films feature her songs (e.g. "Ghosts of Mississippi", 1996: I Wish I Knew How It Would Feel To Be Free; "Stealing Beauty", 1996: My Baby Just Cares For Me; "One Night Stand", 1997: Exactly Like You; "Mukhsin", 2007: Ne Me Quitte Pas). On July 24, 1998 Nina Simone was a special guest at Nelson Mandela's 80th Birthday Party. On October 7, 1999 she received a Lifetime Achievement in Music Award in Dublin. 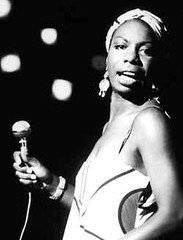 Nina Simone passed away after a long illness at her home in her villa in Carry-le-Rouet (South of France) on April 21, 2003. As she had wished, her ashes were spread in different African countries. The Diva, who was as well an Honorary Doctor in Music and Humanities, has an unrivalled legendary status as one of the very last 'griots". She is and will forever be the ultimate songstress and storyteller of our times. In response to The Viz's request, here is a photograph of the very sweet and supremely literary Elyna. 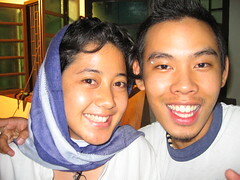 She was the producer for Sepet and Gubra, and will soon be in charge of post-production for Muallaf. Hey, take your hand off your crotch, Viz! She was one of our hosts at the retrospective in Honolulu, organised by the University of Hawaii. Paul Rausch, the head of the organising committee, had arranged for Yati to conduct the interviews on stage, after the screenings of "Gubra" and "Mukhsin". This photo was taken right after the final interview. Yati had asked such good questions that I felt she deserved a wet kiss on her left cheek. Now you can place a face to the postings. He is a cynic. He is quiet. His sharp, piercing eyes avoid your gaze, but once they focus on you, see right through you. 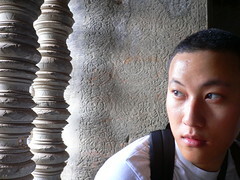 He is 29 years old and looks Tibetan. He is perfect for the role of Brian in our new film "Muallaf", the rehearsals for which are scheduled to begin on May 2nd.